It was easy to talk big to Castiel. The thought of actually talking to Sam, however, made him feel like a coward. He didn’t know what to say. No, he knew what to say. He just didn’t know how to make himself say it. It went back to being weak, that fear of seeming like he didn’t have it in control. He wanted his brother back, but the notion of letting his own vulnerabilities come to the foreground to help bring about reconciliation scared the crap out of him. It had taken more than a little cajoling to get him back on board with hunting, and a whole hell of a lot more to make him believe that he could save the world--so the idea of approaching Sam and letting someone see his flaws again? Not high on the list of things he wanted to do. But he did want his brother back. It was a question of which he wanted more. And if he’d learned anything over the last few days, it was that there was no question at all. He found Sam sitting in the bed, looking clean, but still as weary as ever. Castiel’s apology had confused Sam, left him reeling, and Dean could see that the kid still wasn’t sure what it meant--for him and for them. “Very spongy,” Sam returned quietly. Sam’s smile faltered, and he looked down. It was supposed to be reassuring, but Dean could see it was having the wrong effect entirely. Sam looked positively droopy on the bed, like someone had just run over his dog. Of course, Sam didn’t have a dog; he just had a guilty conscience that simply would not quit. It was more than Dean could take. He was trying to rebuild the connection, trying to work his way into some kind of apology, but Sam couldn’t stop with his own self-deprecating apologies. At this rate, they weren’t going to get anywhere. “You don’t have to do that,” Dean said suddenly. Sam still looked blank, but his eyebrows rose a little. “I just thought you would want me to clear it with you first,” Sam said. Sam just looked confused. “I don’t have to go the bathroom right now,” he said. Groaning, Dean put his head back. This wasn’t working. He didn’t want another guideline Sam thought he had to follow. He wanted Sam to understand that it was okay to just live, that Dean didn’t have to keep in check, because Sam could keep himself in check. That Dean trusted him again. It was just kind of hard to, well, say. “Look, I just--I mean--I know you’ve screwed up in the past, okay? You screwed up bad,” Dean began. Sam’s body went rigid, his face tight. He blinked rapidly, nodding his head, quick and fast. 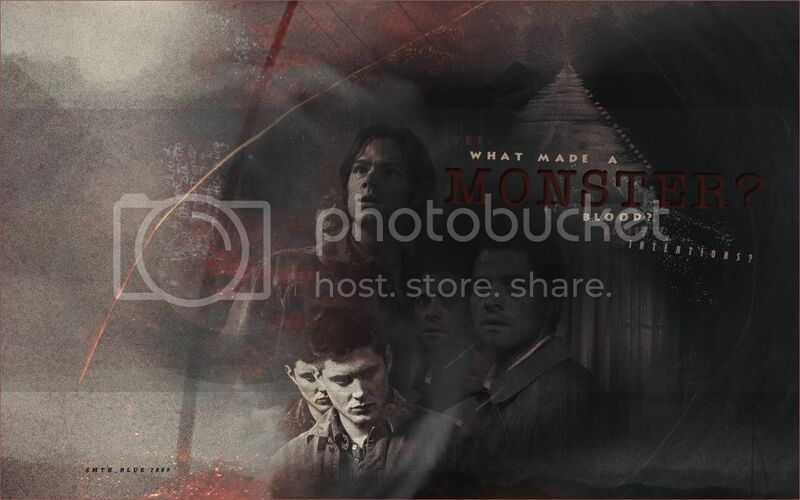 Sam’s jaw quivered, and Dean could see that his brother wanted to look away, but true to Sam’s new self-flagellant nature, he refused to allow himself that much. A tear slipped down Sam’s cheek, and this time Sam did look away, his head dipped in shame. “But people change,” Dean pressed on, and this was the important part. Important because Dean had spent a long time pushing Sam away, keeping his brother away. Sam wasn’t the only one who had something to atone for. It was time to understand Sam, to really know him. “It’s not the same,” Sam insisted. Sam looked at him, his eyes begging to understand. “But...how?” he asked. It was obvious that Sam wanted to believe him. There was a desperate quality to Sam’s expression, but it was masked with fear. Fear to believe, fear of himself--Dean wasn’t sure. But they were close, now. Close to coming clean, close to making amends, close to getting back to the closest thing to good that they could ever hope to have at this point. Bobby was right, though. Sam was strong-willed, in all the best and worst ways. Sam’s eyes blazed with the vestiges of his defiance. “You can do this alone,” Sam said, his voice strained and soft. Sam’s breathing hitched, and a sob broke free. Even after all this time, they both remembered what started them on this journey together. Especially knowing the burden Sam carried. The guilt he refused to give up. “Castiel did all the hard work,” Sam said with a shy grin. A/N: And that is that! If only it were that simple. Prompt: The brothers are hunting something (your choice) in and around a rocky mountain side. Sam saves both his brother and a civilian, but sadly falls in doing so. (can be into a raging river, steep incline, waterfall, your choice) He has to survive and get back to his brother. Show Sam's struggles to survive, but his awesomeness in being too stubborn to give up. DEMONIC BUNNIES!!!!!!!! And you worked a yak in there, too. I know it!! Only you, ME, can take all these elements and make something so complete and true and heartwrenching. Make Sam AWESOME and bring the brothers back together in a way we PINE for the show to. Would that things really were this simple. And Dean is PROUD of Sam! MEEP! I don't know why a prompt about Sam surviving nature automatically makes me write about DEMONIC BUNNIES. It wouldn't be so bad if I hadn't already written and posted a fic with demonic bunnies. I AM WEIRD. Demonic woodland creatures is the best thing I've ever seen in a Supernatural fic. Hilarious. This was such a good story I just don't even have words beyond "awesome." Demonic bunnies. Dean saying he didn't want to hunt the bunnies. And I had to take a break from the story because I was laughing so hard I couldn't breathe. But this story was BEAUTIFUL. Oh my god this was fantastic!!! So much limp!Sam and angsty!Sam and guilty!Dean and there were so many points in this where I stopped and pointed and went, "YES. THIS." So many truths you exposed for both boys and Castiel. LOL, yeah. Demonic bunnies. I can't even explain how that happened. But I'm glad you liked it. There are a lot of emotions post S4 I want to see resolved. I'm not overly optimistic that the show will do it justice, so I'm doing it as best I can before canon rears its head. Which part is my favorite? The way you so effectively portray how empty their lives are in the beginning, how Sam is no more than a shell, a shadow of himself? Having Bobby tell Dean to "be good to him" just like he did in the episode, which triggered the same tears from me again? Dean realizing that saving his brother (by making the crossroads deal) had a cost beyong his time in hell; it actually cost them the inherent love between them? Dean realizing his purpose isn't something assigned by his father, or by the angels - it's something he chooses for himself? Or the wonderful echo from the pilot - Sam saying that Dean doesn't need him, Dean can do this by himself, and Dean admitting "Yeah, but I don't want to." He wants Sam at his side. I dunno. I guess I like it all *g*! I really hope the show gives us a broken Sam--because, in my mind, I can't see him any other way. It's such a deep and fascinating brokenness, that it could be some of the best storytelling to date if they do it right. Ultimately, I want these two to realize how similar they are. And that it's always been about family, even when it hurt and even when they screwed up. They need each other and they're better together than apart. Aw, thanks! I've been horrible at keeping up with anything these days, but it's good to hear from you! And I'm glad you enjoyed the fic! I have serious reservations about S5--but if the show can give us something of the boys recognizing how they both hurt each other and bring them together? I will be very happy. This was wonderful. I hope that when (if) the show resolves the relationship between Sam and Dean that Dean's part in the rift is not minimized. You did a great job of showing what I truly believe, that these are two flawed, good men who have both made terrible mistakes, often in the name of love for each other. Lovely story of atonement and of grace. I love Dean's slow growth into understanding and the way Sam needed his brother's forgiveness first before he could start forgiving himself. Thanks so much! I sort of hope that Dean's growth this season allows him to see past his own anger and realize that the damage Sam did was more to Sam himself than against Dean. Not that Dean shouldn't feel betrayed, but that Sam lost himself long before he ever turned his back on Dean. Sam's been falling apart for four seasons, and I just hope someone notices (with compassion) in S5. Demonic bunnies! Almost killed me! And Dea debating with Cas in the middle of it all. Hilarious! Yet this story was inherently so very philosophically deving and sad, Finally, finally Dean is getting it. Some of the thruths he's denied for so long. He's finally looking at his own actions and motives from a mature POV. Sam did die at Cold Creek, not by the stab wound but by Dean's deal and his own failure to save his brother. And he keeps dying a long painful death with wevery failure he has to sustain. Sam is incredibly strong in facing his own shortcomings. (And you're so right, kripke has made Sa seem invincible; he's tossed aroud and shot and cut and he stitches himself up!) Kripke better give me a explanation to why Sam is instantly fixed while normal people would have died many times over! And then “Looks like we found each other, Sammy.” from your keyboards right to Kripke's script! Wonderful story this is my Sammy! The hero in disguise; heroic in silence, without even knowing that what he does matters. Because it does. The artwork is just stunning! Demonic bunnies...I know :) Sometimes my mind is a weird place. And Sam? Is the biggest hero I know--what he's endured, what he's had to face ALONE, and how he keeps GOING. Is epic. I wish someone around him would notice. Faye- you just ripped my heart out and then stomped on it multiple times. This is my second read of the story and I sobbed both times while reading through the entire thing. I liked that it was from Dean's POV but at times I thought that he was one of the angels so totally and utterly cruel to Sam especially while thinking about Sam's actions. I think of Dean as being a very black or white person and I also think that it makes him a suitable ally with the angels...I absolutely loved that Dean did come to realize that his sole purpose is to just be a brother. Castiel- what can I say? your Castiel is the absolute role model for an angel but at times you made him human- I really liked that! On a personal note- as much as it would kill me to see it played out- this needs to happen on the show but for a little while. I can only pray and hope that Kripke doesn't diminish Sam's role to a sidekick and allow him to come full circle ON SCREEN!!!! I have my issues with Dean right now, because of his implicit cruelty and his acceptance of angels who have also been overtly cruel and manipulative in regards to Sam. Sometimes I feel like Dean wants to outgrow his family, move beyond them, and while I do think he needs a better sense of his duty to his family, I would love for him to realize that it's not about being better than them or getting them to do what he wants, but that he needs to see them for who they are and accept them unconditionally. And find strength in THAT. I'm very worried about S5...part of me would rather not watch, but I have no willpower. If Sam is the sidekick, he will still be my favorite part of the show, I don't doubt, because his depth and tragedy is so compelling. Oh wow Faye, Sam is awesome and this story is made of awesome. Gosh, this coming season scares me- if it could all fall into place like you've written here, I'd be a happy girl! Beautifully written, as always. Wonderful exploration of Dean’s anger – and boy is he angry. And Sam – wow. In the opening chapter, he’s so broken, it breaks my heart. But beneath the guilt and the hurt, there are glimpses of the old Sam – and when Dean realizes his brother stayed in the river searching for him, I smiled. Yes! Our boy’s in there somewhere. Loved how Bobby was still the voice of reason in the brothers’ lives, and you really captured the cadence of Castiel’s speech and his droll sense of humour. Great adventure sequence with the rockslide and lovely h/c as Dean, in danger of losing Sam, lets go of his anger and finally gets his priorities straight. “If Sam died right when they started being brothers again…” Nice - the flip side of the coin to In My Time of Dying. And then there was a simple sentence which I hope becomes the theme of Season 5: “Maybe it was time to restore the balance.” Amen to that! But my favourite line of all was Dean’s simple yet HUGE: “But I need you to know, that for me, for us, I trust you.” Hallelujah. Honestly, I know Sam was the one who was more overtly "wrong" the entire season, but I have had a far easier time empathizing with him than I have Dean overall. In all of Sam's action, in his demon blood addiction and trust of Ruby and killing Lilth--I saw Sam desperately trying to do ANYTHING. After nearly four years of being almost completely impotent when it matters, I just felt like Sam had broken completely. Going after Lilith was his only coping mechanism. Even though Dean was the one breaking down over Hell (and rightfully so! I don't begrudge him that! ), I think Sam was the one who was still completely lost. Dean was coping with issues and healing. Sam was just floundering. And no one saw it. I want Dean to see it. Not in terms of how it affects HIM, but in terms of what Sam has lost and how little Sam has left to work with. I'm rambling--sorry! There's just so much depth there, and I hope S5 deals with at least a little of it. Ahahahaha!! Wildlife gone... well wild! This was awesome, wonderful, adorable, and just exactly what was needed!!! This was so heartbreaking; my chest aches for poor Sam and everything he was going through, and I can only imagine how bad it's going to be when S5 starts!! This was an incredibly angsty ride, I think you broke me!!! Fantastic job! Poor Sam indeed. What strikes me about his predicament is that he was falling apart so horribly and no one saw it--at least, not outside how it affected them. I so wanted someone to look at Sam and realize not that he's an arrogant jerk, but that he's a broken man who is barely holding on. We'll have to see what S5 brings. I'm not totally looking forward to it. Faye this story was wonderful. It made me laugh and cry, but most of all root for our wonderful Sammy. Sam is totally wonderful--and I'm glad that came across. I was worried I got too into Dean and that some people would take Dean's anger at face value and think he was totally right. I get why Dean will be angry, but honestly, I think if he had much compassion or understanding of what Sam's been through, he wouldn't hold it against Sam for long. Though you were right not to 'fix' the boys, you started them on that road to try and work things out. Loved the L!S, loved the man!pain, (as someone called it) and the angst was through the roof! The boys had a lot to go through, I figured this was the most realistic outcome (even if I wanted them to hug!). All in all, I'm thrilled you liked it. I wanted it to be everything you dreamed of and more, and I was worried that it wouldn't be quite right since it was all Dean's POV. So I'm so glad you enjoyed it! Thanks for such a fun prompt to play with!